Port Pothuau offers a luxury camping experience in a stunning natural location. Set in the sunny Provence region of France, this luxury camping site places guests within easy reach of the Golden Isles with its unique natural beauty complete with stunning sandy beaches and pine forests. An excellent range of onsite activities and facilities ensure that people who book a mobile home at this impressive LUX-camp will find everything they need right on their doorstep. What Makes Port Pothuau So Special? A beautiful sandy beach is situated less than a mile from Port Pothuau, making this is the dream place to spend sunny summer days. The cool, clear water here is calm and ideal for family bathing, while there is plenty of space on the sand to simply spread out and catch a few rays. Guests are treated to a complimentary shuttle bus service to and from the beach, which makes getting there extremely easy. 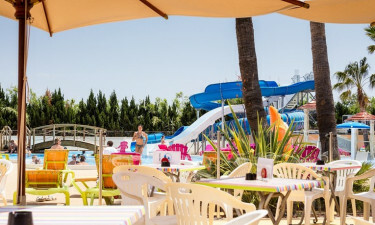 The onsite aqua park has been recently renovated and features large water slides – perfect for those young adventurers! 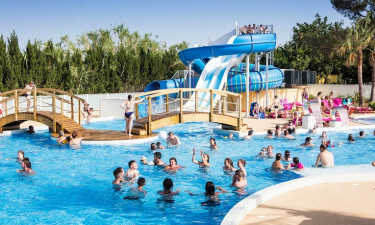 Younger children will not have to miss out on the action, as the aqua park also features a colourful paddling pool for them to splash around in. Unwinding in the Jacuzzi is another experience that the whole family is sure to love here, while various types of water sports and games are regularly organised for guests to enjoy and anyone who has a competitive streak is sure to want to take part and test their skills against those of the other guests. The children are sure to experience the camping holiday of a lifetime when you stay at Port Pothuau. Special swimming courses and a wide range of other activities are organised for the children to enjoy while their parents unwind and there is also a large children’s play area onsite. Playing a game of mini golf is another experience that the kids are sure to love and they can have fun playing with their new friends and with their parents. Searching for instant refreshment? There is a good range of tasty treats waiting for visitors at the onsite snack bar. An excellent restaurant is also available for anyone looking for something a little bit more substantial and this is the perfect place to celebrate a special occasion with loved ones and really indulge before finishing the meal with a glass or two of locally produced wine and other alcoholic and non alcoholic beverages. Promising to be the perfect spot for a picnic, guests will be happy to know that this LUX-camp features a large supermarket that is stocked with everything they need to put together meals and snacks.